By 1956, my mother, then in her early thirties, had spent most of the previous decade as a school teacher in the Wilmington, Delaware, public schools. But after a difficult end to a love affair she left Delaware to take a job in Weston, Massachusetts. I’m not sure where my mother lived, but she saw a lot of her parents, who lived in Peabody. My mother once showed me my grandfather’s diary entries from January and February, 1956. I don’t remember much from that diary, except that he was a member of the Board of the Salem church, and that he went to Sunday services regularly, often accompanied by his granddaughter Anne. He made the last entry on February 27, the day after his sixty-fifth birthday. The rest of the diary was blank. On Tuesday morning, February 28, 1956, a snowy winter day, my grandfather set off for the Peabody train station, to take the train in to Boston. My mother said he had just started a new job; she remembered being struck by how excited and nervous he was about it. At the Peabody station, he boarded Boston and Maine train no. 2406. The train consisted of four Buddliners, self-propelled railcars that needed no locomotive. My grandfather took a seat in the front of the first car, and the train headed south through the blowing snow. The train joined the main line after the Salem station, and headed towards Swampscott. Thick, heavy snow was coming down fast, and blowing so that it covered the lenses of the signals. That meant the engineer would have been unable to see whether the signals shone red or green. Train 2406 was not equipped with a radio, and when the signals were not visible engineers were supposed to stop the train and contact the dispatcher. But the engineer of train 2406 did not stop. He knew there was another train, train no. 214 with a locomotive and six passenger cars, heading south on the same line just ahead of him; if he had stopped to call the dispatcher, he would have learned that train 214 had stalled on the tracks a quarter of a mile from the Swampscott station. But he just kept going. When train 214 stalled, a member of the crew was sent to walk back along the track to signal any approaching trains. Train 2406 came out of the snow, going between 40 and 50 miles an hour, and the man from train 214 held up a red flare as a signal. But for whatever reason — operator error, excessive speed for the conditions, lack of familiarity with a new brake system — train 2406 did not even slow down. Train 2406 hit the rear of the stalled train, hitting with such violence that it shoved the train 214 some fifty feet down the tracks. The photographs of the wreck show an appalling scene. One photo in the collection of the Swampscott Fire Department shows that the first Buddliner in train 2406, the car my grandfather was sitting in, went under the rear car of the stalled train. 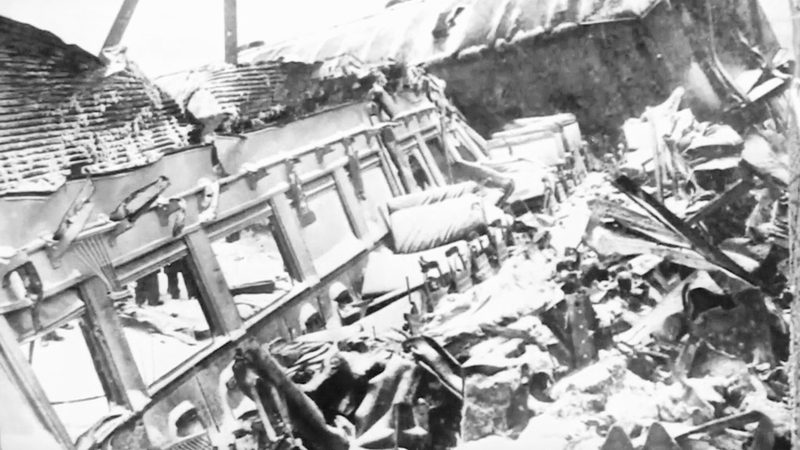 The front of that first Buddliner became a mass of crushed metal; the roof of that first car was torn off, the left and right sides flattened outwards, and the seats torn off the floor. Thirteen people died, among them my grandfather; all those who died were in the front Buddliner, car number 6150. Many of those who died were reportedly decapitated or cut in half. The engineer was one of those who died, so we’ll never know exactly why he didn’t stop his train. A year ago, when my sisters and I were cleaning out my father’s condo after he went into an assisted living facility, I came across a box with a label, written in my mother’s neat schoolteacher handwriting, saying that the box contained some of my grandfather’s personal effects from the day he died. In the box lay grandfather’s gold watch, watch chain, penknife, and gloves; presumably my mother had gotten them from her mother, and had kept them together. Nine months after the train wreck that killed her father, in the fall of 1956, my mother met a nice electrical engineer named Bob Harper, and nine months after that, in June, 1957, the couple were married out of the Salem Unitarian church — married out of the same church that had held her father’s memorial service nine months earlier. If you ever find yourself in the Swampscott commuter rail station, look for the low stone monument that lists the names of all those who died in the crash. The victims are listed in alphabetical order; my grandfather, Walter D. Allen, is the first name on the list. My cousin Nancy says our grandmother learned about her husband’s death when a newspaper reporter came to the house, knocked on the door, and asked for background information on our grandfather. The funeral of Walter D. Allen, 65, of 44 Andover street, Peabody, the husband of the former Marion Congdon of Framingham, will take place Thursday afternoon at 2 o’clock with services in the First Church (Unitarian) in Salem. Mr. Allen was one of the 13 person killed in the Swampscott train wreck Tuesday morning. Later he came to Boston where he was with Stone and Webster and the A. L. Hartridge Co. From 1933 to 1935 he was a special assistant to the building commissioner of the City of Newton. He left that post to become chief engineer for the A. C. Lawrence Co. in Peabody. He went on vacation three weeks ago and was scheduled to retire at its conclusion. SWAMPSCOTT, Mass. UP — Investigators said today a railroad engineer who died with 12 others in the wreckage of two Boston & Maine commuter trains was responsible for the smashup. Sixty persons were injured when the Silver Budd Highliner smashed into the rear of a nine car diesel passenger train in a blinding snowstorm. A B&M investigating board said the Budd Highliner engineer, Ernest Toutellotte, 55, of Winchester. raced his train past two signal lights and a franticallywaving flagman moments before crashing into the halted diesel. 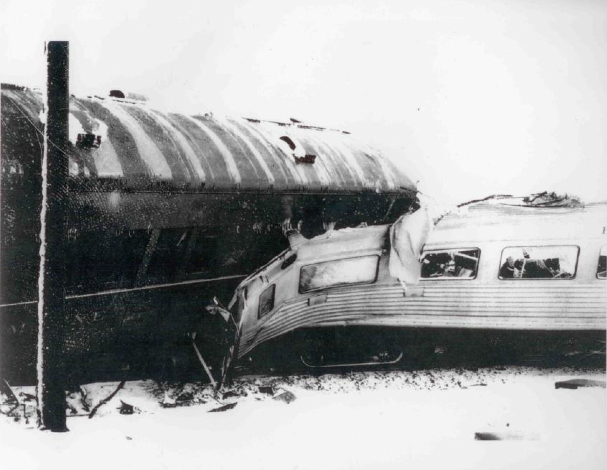 The aluminum-sheathed Highliner’s first car split apart, the twisted metal shrieking under the impact as it upended two rear coaches. The two trains were jammed with about 1,000 passengers. Bodies were strewn on both sides of the tracks. A few were trapped in the wreckage. Tourtellotte’s mangled body was found alongside the fireman, Raymond F. Jones, 28, of Lynn. Officials, who called it the worst wreck in 38 years in New England, said the engineer had violated a railroad operating rule in running past the signal lights. Both were operating, a spokesman said, but were obscured by the blinding snow. Both trains were on the B&M’s main line which passes through this small North Shore town, 12 miles from Boston. The wreck occurred about a quarter of a mile north of the Swampscott station.